The exchange rate keeps changing but today you would get about 540 colones to the dollar, depending on the bank. What you would have at the end of the year depends on a lot of factors, primarily the interest rate of your CD and the value of the dollar at the end of the term if you want to convert the colones back to dollars. 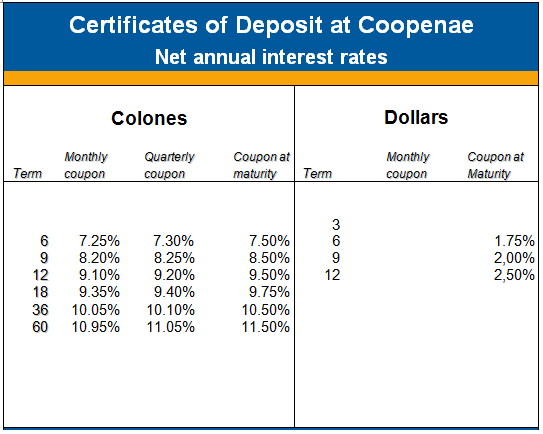 To see how these rates compare to the current rates at other banks and credit unions in Costa Rica, click here. But before you could do any of this, you would need to qualify to open a bank account in Costa Rica, and it’s much harder to do these days. We wrote an article about this shortly after the laws changed. Also, AM Costa Rica recently published an article called “Foreigners face barriers to open a bank account” (4/14/14) which you might want to read as well. Unfortunately, just purchasing property here does not allow you to open a bank account. Now, due in part to to the U.S. Foreign Account Tax Compliance Act (FATCA) requirements, one almost always has to be a legal resident to open a bank account in Costa Rica. We are not financial advisers, so be sure to get investment advice from someone qualified to give it. We did pay bank fees in the beginning but haven’t for at least 3 years now. The short answer is that we write checks from our U.S. bank to our Costa Rica bank (credit union). It takes a month for the check to clear but we plan accordingly. That way we don’t have the high ATM charges whenever we need cash. Please note that you have to be a legal resident of CR to open a bank account these days (see above). Where are the best places to do currency exchanges in SR? Private banks are reported to normally have shorter wait times. Do you have any recommendations for those that would not have a local account as you do? We find that private banks like BAC-San Jose and Davivienda have shorter lines than the national banks. You will need your actual passport to change money — some banks won’t accept just a photocopy.